Jonnie Jacobs is the author of two interspersed series. Her first series character was Kate Austen, a single mom and an amateur sleuth who makes a habit of stumbling across bodies. Her second has been Kali O’Brien, who is a lawyer by trade, and whose profession may make it easier to become involved in mysteries. Jacobs’ latest book, however, The Only Suspect, is a stand-alone thriller, in which ... well, hold on, it will come up in the questions that follow. This interview was conducted by email in October and November, 2005. PJ. Jonnie, how long does it usually take you to write a book, and how many are you contracted for over the next year? JJ. It takes me about a year. I’d love to be able to write faster, but my brain is slow! I need time to let the idea percolate, to tweak them and then tweak them again. I’m now working on the next Kali O’Brien book, which should be out late 2006 or early 2007. PJ. Let’s talk about The Only Suspect. Can you tell us something of what it’s about? Where did you get the idea for writing this book? JJ. Like with so much about writing, it’s a compilation of many things, all coming together without conscious thought. We had a neighbor years ago who was accused of killing his wife (turns out 20-plus years later he didn’t do it, but at the time, he was a major suspect and the crime wasn’t solved.) I also had the experience of waking up one afternoon (sleep deprived from spending days on end in the hospital with my son) and not knowing who I was, where I was or having any memory of the last twenty-four hours. In my case, it lasted only a few seconds (felt like a few hours and was very scary). And lastly, there was the Scott Peterson trial in the news as I was writing the book. PJ. When do you write best and where do you write? JJ. I write in an upstairs bedroom – it’s all mine and nobody touches the computer but me. It’s got a view of the San Francisco Bay from the window, and since I spend a lot of time “lost in thought,” that’s a nice addition. I used to write first thing in the morning, after I got my kids off to school. Now my kids are grown, and I find that it’s hard to settle down and write until I’ve taken care of most of the errands and other minutia that’s part of living. So now I tend to start about noon. When my husband is out of town, I work into the evening. When he’s home, I usually stop in time to make dinner and spend some communal time. PJ. Tell us more about your background as a lawyer. What type of law did you practice and where? How did it help your writing career? JJ. I received my law degree from Boalt Hall (UC Berkeley School of Law) and went to work for a large San Francisco law firm, doing mostly real estate and business law. I’m not sure it did much to help my writing career, in truth, except that quitting (well, technically taking a leave of absence) to be home with my children allowed me time to actually begin writing. PJ. You have written more than one series. Is it hard to keep going from one series to the next? JJ. It wasn’t hard for me. In fact, I enjoyed the variety. But the publisher thought it was less than ideal in terms of building a readership. That’s why the last few books have been in my Kali O’Brien series. 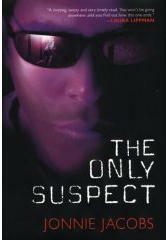 Having said that, I should point out that my new release, The Only Suspect, is a non-series book. PJ. The most recent Kate Austen book was Murder Among Strangers, which came out in 2000. Was she divorced or married when the series first began, and how did she evolve through the series? JJ. Kate was married when the series started, but her husband had gone off to travel around Europe and “find himself.” She discovered that what he’d found himself was another woman. As the series progresses, she and Andy divorce, although he returns to the Walnut Hills area, and Kate takes up with a police detective Michael Stone, whom she met in the first book. PJ. Will you ever bring Kate Austen back in another book? JJ. I’d love to, but it’s a decision my publisher needs to make, not me. PJ. What is the best and hardest part of the book for you to write? JJ. The best part for me is the beginning because the story is wide open, and the characters are waiting to be discovered. It’s also the hardest because it gets rewritten probably more than any other part of the book, and it carries such a burden in terms of hooking the reader. The best part is also the end because I’m done! But that is also hard because I want it to make sense and to tie things up. The hardest (and not ever the best) is the muddle of the middle, when I ask myself, “Why did I think this idea would work, anyway?” Bottom line, it’s all hard, but rewarding. PJ. What is happening for you in 2006? JJ. Good question. The book I'm working on will be finished. Who knows what comes next? PJ. How do you stay motivated to write? JJ. Well, I read and live and look and listen. Those are always great inspirations. And then I force myself (many days) to turn on the computer and do it. If I waited until I was truly inspired, I’d never write. Motivation comes, usually, about twenty minutes into whatever I’m writing. PJ. Do you have some favorite characters in your books? If you do, tell us about them. JJ. Too many favorites to list. But they are the minor characters. They’re fun to write because I can create them fresh and leave them when the book ends. I do love my main characters too, but I have to use more caution when writing them. PJ. Let’s talk about your book covers because you have some really great ones. Do you have input on the covers? JJ. I have input, but truth is, I’m usually overruled. Good thing, too, because I am not a visual person. PJ. What do you like to do when you’re not at the computer writing? PJ. Last but never least, do you have some words for your readers? JJ. I’m always a little surprised to find people really do read my books! Writing is a private kind of experience. You put your heart and soul on paper, and expose yourself in ways too complicated to explain. And then to find that you’ve touched another person's life in some way, it’s kind of amazing. I am, of course, thrilled to know that people read and enjoy the books. And I love hearing from readers. They can reach me at jonnie (at) jonniejacobs.com. I really try to personally answer every email. Jonnie Jacobs’ website is located at www.nmomysteries.com/jonnie. The Only Suspect. Kensington, hardcover, Oct 2005. “Doggone.” First appeared in Canine Crimes, Jeffrey Marks, ed. Ballantine, paperback original, Nov 1998. “Built Upon the Sand.” First appeared in Women Before the Bench, Carolyn Wheat, ed. Berkley, hardcover, March 2001.